Some may be surprised to learn that people in all demographics get matching couple tattoos. The image of the rebellious and foolish in love pairing getting matching his and hers ink might be the stereotype, but it is far from the norm. Romantic couples, families, and friend groups are frequent recipients of coordinating or matching tattoos. Young, middle-aged, or old, people want to show their commitment to those they love. This question can be the same as why anyone would get a tattoo in the first place – perhaps they want beautiful artwork on them forever, want to recognize an important event in their life, memorialize a loved one, or highlight an interest they have. There are many reasons why a person gets a tattoo, and those reasons are the same for couples, friend groups, and families that get tattoos together. The tattoo is significant to them individually and made even more significant and meaningful when shared with their loved one. An Exact Match or Complementary? One of the great things about a couple tattoos designs is that they can be fully customized to exactly what each person wants to have on them forever. The design can be complementary, such as: a lock for one and a key for the other, a queen’s crown for her and a king’s crown for him, or two parts of a complete quote. A matching tattoo can be that of a shared interest or significant item in their relationship like a slice of pizza, a favorite animal, or any item with personal meaning. Wedding and engagement rings are intended to be forever, but for anyone who has lost one down the drain, fallen victim to a lapse in memory after taking it off, or damaged it at work or at play, it can be an expensive item to replace or repair. A tattoo in place of a wedding ring is a permanent solution and will never end up having to be replaced. It’s also a fantastic alternative for people with jobs where the wearing of jewelry is prohibited (such as manufacturing, machinery, and other active pursuits) and the person still wants to display their commitment to their partner. Tattooed rings, words, monograms, and other such designs can work wonderfully as a fun alternative to the traditional wedding ring. Getting a tattoo with your significant other, family, or friends is also a marvelous bonding experience. The couple is going through pain together to end up with something beautiful at the end, which mimics a relationship – sometimes there’s pain, laughter, fun, caring, and the end result is extremely rewarding. The story of you and your partner getting matching or complementary tattoos is one that will be told regularly for the rest of your lives. Having the tattoos is a constant and present reminder of your love for another person and their love for you. The bond the couple tattoos commemorate is forever. A tattoo you share with your partner is a daily reminder of your love, connection, and commitment. When times get rough, the tattoo serves as a keepsake and can bring couples closer together by remembering all of the best moments they’ve had together. Come in to the shop or call to set up an appointment to discuss your ideas. We look forward to sitting down with you and your partner to come up with your perfect couple tattoos designs! 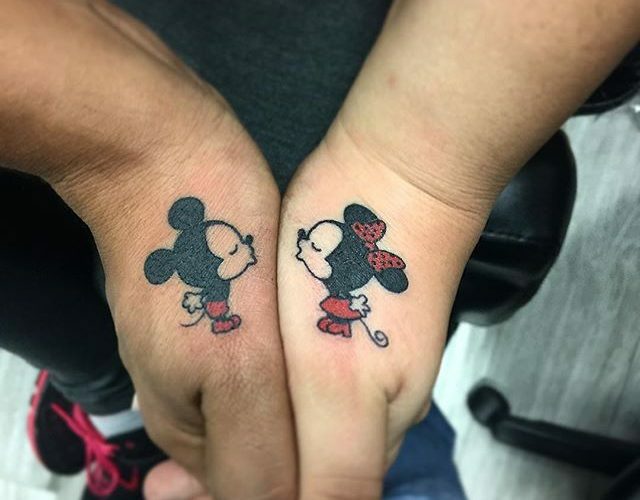 We are happy to recommend styles, colors, placement and more, but in the end, we want to make sure that your perfect couples tattoo dreams come true!